A three-day journey fueled by entrepreneurship, creativity, and innovation! 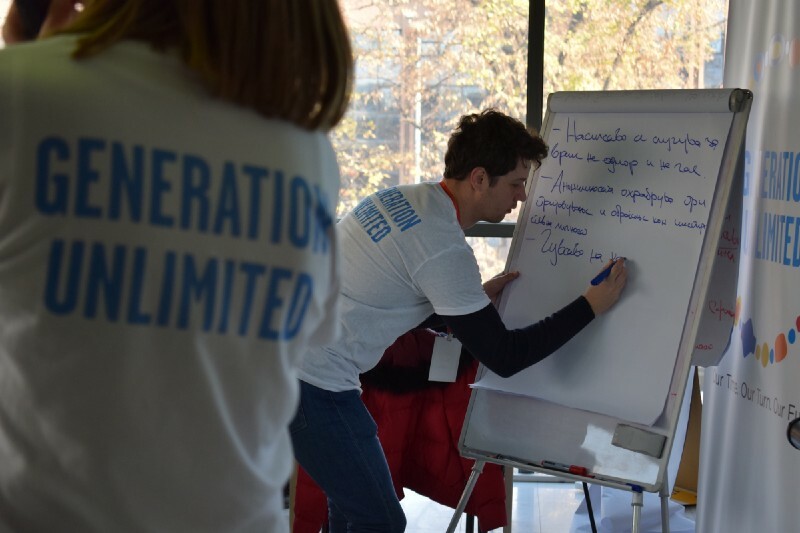 As you probably already know from our previous blog, Generation Unlimited — Youth Challenge is an inclusive designing process which in Macedonia this year calls on all you, the young people to actively engage as “decision-makers” and design innovative solutions in order to end violence against and among children. 3. Further Development through a mentoring period of 3 months. At the end of the three month period of incubation, the countries best and most promising two solutions will receive financing and mentorship and the top 5 solutions globally will receive additional financing and specifically designed support from the Generation Unlimited partners. The main workshop for co-creating innovative solutions to #ENDviolence began on the chilly Friday morning of 16th of November and already the halls of the library were buzzing with positive energy! We welcomed the young innovators and delved right into our agenda by starting the day off with words of encouragement from the main facilitator, our teammate, Sofija Bogeva who then gave the spotlight to Mr. Benjamin Perks, Representative of UNICEF. As the inspiring words of Mr. Perks’ opening statement filled the room with smiles, we then took the time to get to know each other. Both the industry mentors as well as the technical mentors and the UNICEF staff consisted of Simona Ristoska and Vera Kondikj Mitkovska told us a little bit about themselves and their background, after which the teams got to reflect on the work they had done so far. It was an exceptional honor to also hear from Dr. Rebekah Granger-Ellis, a specialist in NeuroEducation, Socioaffective Development, and Pervasive Behavior Disorders who shared her findings and gave her valued opinion on how to approach the challenge of violence against and among children in the best way possible. We kept the energy going with a couple of energizers which brought the whole room together and created an amazing and creative workspace. In order to develop their ideas into applicable solutions, the 9 teams devoted their first day to design the specifics of the challenges they want to build their solution around. This included analyzing the target group, the stakeholders involved and the “persona” for which they designed their solutions. As our planned agenda for the day exceeded the predicted time, to our great surprise we noticed that the teams had made themselves at home and insisted on staying for the entirety of the evening! It was a day well spent, but there were two more days of hard work yet to come! The busy bees started day two by brainstorming and with the assistance of the mentors they started designing their solutions and building a concrete concept for them. After the teams made the decision on what part of their solution to develop into a prototype, they then got the opportunity to get together, hear out all of the teams’ ideas and get feedback from everyone, getting insight on how to better their solutions for the next days’ final presentation! We ended the day reflecting on what we had accomplished so far and wished the innovators a peaceful night of much-needed rest before the big day. The best part of competition is that through it we discover what we are capable of — and how much more we can actually do than we ever believed possible! The last day of the Bootcamp of Generation Unlimited — Youth Challenge was before us. The teams arrived early in order to have a bit more time to put on the finishing touches on their presentations and work on their pitch. As they gathered up the final pieces of advice from their mentors, the teams were counting down the last minutes. It is amazing to see how much these young people managed to accomplish in so little time! By the end of these three days, inspired and motivated by their own journeys as well as the stories of others, these young minds managed to boggle up 9 amazing solutions! 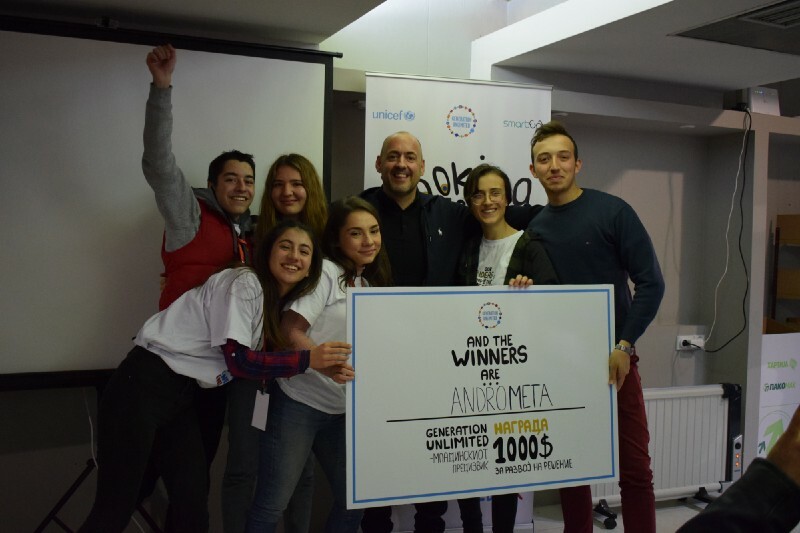 Meet the winning teams of Generation Unlimited- Youth Challenge! A team consisting of 5 femme fatale (as they dub themselves) consider that the solution to the problem should be directly connected to educating and engaging kids, especially in the younger ages and generations to come. This is so that children can know and expect how they should be treated as well as to be able to recognize violence so that they can report violence and continue growing as fruitful as possible. Their idea was developed into a prototype mobile application, a game for children that tells an interactive story. The trick? You choose what happens next. The game enables players to experience as they say “how it is to be in someone else’s skin” and to clearly see the possible results of certain actions. Based on your choices, the player will both gain points that will unlock new hidden “Anti Bully Fighters”; one block or better put, one story at a time. Additionally, players will get information about statistics and data related to the question and the topic of violence and will receive a final scoreboard post each story that will outline the way players choose, what’s right and what’s wrong etc. The interactive model of the game and its built-in gamification systems combined with an interesting outreach campaign will invite and retain users. “We believe it is very important and good for our society to built a single sustainable system for support, with which through the power of art violence victims can connect and bond”. As a tool to put an #EndToViolence, the team sees the solution of creating a movement which through art would increase the awareness about violence amongst younger generations. In an advanced selected part of the city, artist-volunteers would create thematic graffiti which will be a crowdsourced effort to remind bypassers of the important topic at hand, creating beauty in their city via art but also serving a higher purpose, to raise awareness about the problem and involve target groups in the making/workshop process. “Our highest goal is to educate through a tool that will allow kids to identify bullying, help understand the type of bullying, its possible consequences but also dig deeper into the reasons why someone bullies others.” says the “Interconnecting solutions” team. They have developed the mobile game/app called “SuperPako” which consists of interactive stories which a related to real life. Recognizable by their unique mascot, a Lama, the game provides educative materials on the topic of youth violence (bullying amongst students) as well as the opportunity to reach out to other institutions, whether that be governmental or nongovernmental (that are working on the topic) in a fast, easy and youthful manner. “Behind the face and emotions of bullies/violent people, there hides an image and the face of a victim itself. A person that fears whether they will fit in, that feels insecure in their own abilities and one which isn’t good at showing their emotions and needs in the right way.” Addressing the issue via this approach, the team dubbed “Nula (Zero on Macedonian)” wants to create a website which will allow visitors to browse and watch short documentary movies/videos which tell real stories on the topic of intergenerational violence. The platform will also enable users to submit their personal story, to view already told/uploaded testimonials as well as sign up for activities. The team, besides creating the website, has already created their first video based on a real testimony and have developed a curriculum implementation plan so that their website and the program can be included in the primary and high schools around the country, as to directly confront and talk about the issue. Additionally, they plan to use volunteer amateur actors and an interactive campaign to increase their reach and production quality. In their search for a solution to #EndViolence, the team “AndroMeta” conducted an incredibly successful and extensive research in a 24-hour timeframe, with the goal of developing the idea of creating a platform on which violence victims can connect with people/volunteers and trained staff that can aid and assist them. The platform, developed as a high-fidelity prototype by the team allows anonymity, communication, sharing and creating a community with the purpose of supporting victims and raising awareness around the issue of violence on and amongst children. The application offers educative content, advice and personal narratives and stories. In the following three months, the winning teams are going to further develop their solutions in order to submit one of the 5 solutions in the global competition process in the spring of 2019. The global election process will then differentiate the most influential 5 projects which will receive additional financing and specifically designed support from the Generation Unlimited partners in order to make a meaningful impact for the youth worldwide! Generation Unlimited — Youth Challenge is here to inspire! None of this would have been possible without the guidance from the main facilitator Sofija Bogeva accompanied by Vedran Dizdarevic as a co-facilitator, the UNICEF Staff: Vera Kondikj Mitkovska and Simona Ristoska and the amazing team of industry mentors who offered their expertise on various topics: Ardita Zekiri, Bozanka Vitanova, Aleksandar Mitanoski, Gorazd Smilevski, Perica Sardzoski, Blagica Petrova and Dimitar Trajanov as well as the technical mentors: Angela Zafirovska, Aleksandar Kolov, Jasmina Glavince, Aleksandra Bendevska, Dimitar Kitanovski,Filip Spasovski and Snezana Davitkova. Special thank you also goes to Prof. Dimitrinka Jordanova Peshevska and Mr. Vlado Karaev.